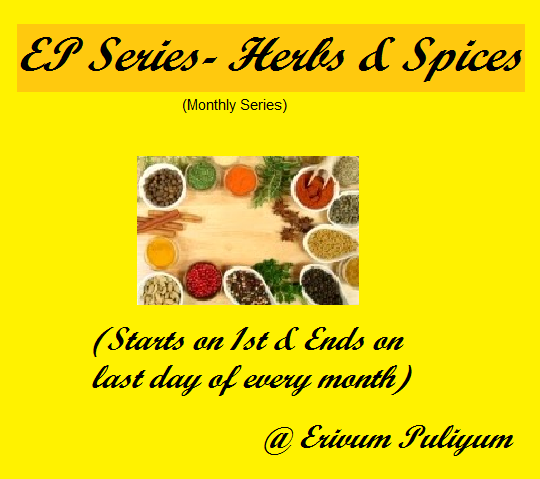 I'm really glad and excited to announce the guest hosting of Julie's EP Series-Herbs & Spices for the month of June 2012. Thank you so much dear Julie for giving me this opportunity. As many of you know that Julie started this monthly event which I believe helps us know the health benefits and use of all the herbs and spice much better. Of course we all use many herbs and spices in our daily menu, but when you are asked to cook with some particular herbs and spice as a main ingredient I'm sure you will definitely give it a second thought which will make you explore much innovative recipes. What say??? Don't you think so?? Give it a try and I'm sure you'll come up with new, interesting and excellent recipes. The Herb and Spice I choose for the month is Basil and Cardamom both being my favorite. Did you know Basil is originally native to India? Me neither, I believed Holy Basil(Tulsi) was of Indian origin and Basil are of Italian as I see them being used in Italian cuisine more till I read about it in Wiki.Where ever may be the origin it is treated as the 'king of herbs' by many chefs and is treated with great respect in many parts of the world. Does Cardamom needs any description?? Not really, I know. But do you know Cardamom is the world's third most expensive spice by weight, outstripped in market value only by saffron and Vanilla(says Wiki). Compound in basil is considered to have potent antioxidant, antiviral and antimicrobial properties and potential for use in treating cancer. Fresh Basil leaves are an excellent source of Iron. Basil contains good amount of minerals like potassium, manganese, copper and magnesium. Basil is traditionally used for supplementary treatment of stress, asthma and diabetes in India. Holy Basil(Tulsi) is used as a healing agent for cold, cough and fever. And yes, it is used as a main ingredient in many Cuisines. It is said to be used to treat infections in teeth and gums, to prevent and treat throat troubles, congestion of the lungs and pulmonary tuberculosis, inflammation of eyelids and also digestive disorders. It is also used to break up kidney stones and gall stones. It is used as a healing agent for cold, cough and fever. The theme for this month is Basil and Cardamom. You can use one ingredient in a dish or use both but that ingredient should be one of the main ingredients. 5. Recipe must be linked to this event announcement page and to Julie's Event Announcement page. 6. You can link both Veg and Non Veg recipes. 8. Usage of the below logo is appreciated for all the entries. That is not the end to it; There are 4 awards for the BEST INNOVATIVE RECIPE AWARD, TOP CONTRIBUTOR AWARD, BEST HEALTHY DISH AWARD & PARTICIPATION AWARD. So, friends put on your innovative caps and think tight, do right and send in your recipes at the earliest before 30th June. 1. Either Basil or Cardamom pods can be used or both can be used. 2. When I say Basil, it can be Fresh basil leaves, dry basil leaves, Holy Basil(Tulsi), Lemon Basil or any variety of Basil. But make sure it is a compulsory ingredient and at-least 1 tsp of them should be used. 3. If Cardamom is being used at-least 3-4 cardamom pods should be used. Best Wishes to All, Happy Cooking !!!! I like flavour of both ingredients. Happy Hosting! Try to send recipes soon. Happy hosting dear,wish you all the very best!! Good luck with the event hosting - will link the recipe soon. just linked up an archived recipe. 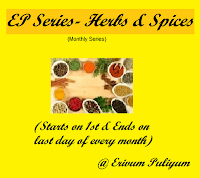 As you picked my fave spice and one of my fave herbs, sure I'll be linking up some more during the month. Awards for you in my space...Do collect..
very nice event dear :-) will surely like to participate !!!! Happy hosting dear.. glad to follow you.. do stop by mine sometime..
:)Awaiting to hear your comments :) Good tat you are mallu.Am also mallu :) Nice to see ur blog an amazing blog. :)Awaiting to hear from u.
I linked my munthrikothu recipe here. Hi, Linked my mawa peda recipe here. Linked my current recipe - Linguine with Pesto & roasted tomatoes. submitted my recipe, Hope its fine. Hi pratiba i have re attached link n post ... now its working fine... do check it... thanks for your comment. Cultures all over the world have incorporated coriander into a wide range of dishes. Coriander grows wild throughout southern Europe and the Near East. Archaeological findings indicate that coriander was cultivated by the ancient Egyptians. British settlers carried it across the Atlantic, and it was one of the first spices they cultivated in the New World. Every part of coriander has use as a seasoning. You know the parsley-like leaves as cilantro, which give their characteristic taste to fresh salsa. They are best used fresh and can be grown in pots or picked up in many grocery stores and ethnic markets. The strong-flavored roots are used in Asian dishes. They are often included in soups and in commercially made curry pastes. They are elusive in the US, but sometimes found in Asian markets. The round seeds, commonly sold as coriander in the US, are common in pickles and marinades. They can be added whole, crushed or powdered to add flavor to dishes. The taste depends on the preparation and what other flavoring ingredients are used with them. Coriander seeds complement other flavors well, adding an earthy note to curries and emphasizing the bright acidity of citrus. These keep in your pantry for about a year and are part of many seasoning blends from U Simply Season. It’s unusual to see coriander acting as the star of a dish. But, it’s an integral part of seasoning mixes in spices from around the world. It plays a part in exotic Five Spice blends, and adds musky character to Tunisia’s Tabil. And, no matter what cuisine’s party it is the life of, curry just wouldn’t be the same without coriander. Here are U Simply Season, you will find it in the palettes of a wealth of seasoning blends .